Gary began in sports photography over 40 years ago shooting with 35mm cameras using Kodak Tri-X Pan film and developing his work. The images were used in his local high schools year book and school news paper. Fast forward to current times and the tools used have change but the love of capturing the action and emotion of sports still drives Gary in his work. 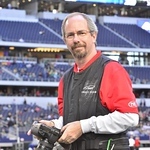 Gary's images have been featured in The Austin American Statesman and Denton Record Chronicle news papers. And since 2014 in Dave Campbell's Texas Football magazines. We thank you for your interest in the images captured by Gary.